Sorry ladies, no more hope to go out on a date with one of the world's youngest billionaires, Mark Zuckerberg, because the guy is now married. The founder and CEO of Facebook just tied the knot with his long time Chinese-American girlfriend Priscilla Chan. The two met at Harvard University and were said to be together for over nine years. Wow, that's long enough so it's about time! Mark and Priscilla have been very private with their relationship that finding photos of them together in the world wide web wasn't easy. 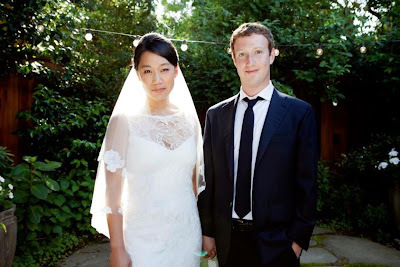 Finally, May 19, 2012 marked the big day when both Mark Zuckerberg (28) and Priscilla Chan (27) changed their Facebook status into "married". Mark shared this photo in his Facebook wall to which almost 500, 000 people already clicked liked and almost 500 people commented. Priscilla graduated with a degree in pediatrics at the University of California (San Francisco) on Monday. That was the same day that Mark turned 28, so nobody suspected that it was going to be a marriage ceremony when guests fewer than 100 gathered at his backyard in Palo Alto, California on Saturday! Congratulations and best wishes Mark Zuckerberg and Priscilla Chan!! Welcome to the marriage life!!! Are you serious!?!??? Is this the crazy Asian chick from the movie??? If so, this is absolutely epic. You just made my week.